Earlier this year I met the owner of Blue Point Timing and Race Management in Annapolis, Ron Bowman. He has worn many hats in the Annapolis running community and continues to coach many runners in addition to running alongside them, and is now well into his second year of operating his race management company. It was when I met Ron that I learned about the Ben Moore Memorial Half Marathon and 10K and put it on my calendar as a summer race. The race is in honor of another running coach, Ben Moore, who was also a Marine and so the race started and ended at the Truman Parkway Park n’ Ride where Ben, and now Ron, begin and end many group training runs. I’ve lived in Annapolis for over seven years but there are plenty of places I’ve not been before and this park n’ ride is one of them. I knew the race was going to be small and registration was going to be held the morning of the race at the start area. As happens with me on all race days I woke up before my 5:30 a.m. alarm excited for the race. I wanted to make sure I’d have plenty of time to get ready, find the park n’ ride, and get registered before the 7:30 a.m. start gun. I sort of knew where to go to find the start location and even though I knew the race was going to be small I was stumped to find that there weren’t any signs pointing runners to the race location. I also knew that Ron was operating as a one-man show most of the time and that he was relying on a small pool of volunteers to help for the day. I knew I was in the right place because other runners were milling around the parking lot but it took me some time to find the humble registration table set-up. I started to have mixed feelings about the small race. I absolutely wanted to support Ron and his efforts to put on local races. A friend of mine was helping to time the race and along with her volunteer time I always appreciate the work of any volunteer. Standing in the registration line with other runners we talked about how great it was to have such a reasonably priced timed half marathon right in our backyard. And that is when I realized that no matter the size of a race, races are races and runners are runners and that is what it’s all about.I love watching other runners before a race; it’s fun to see what routines others have and how they prepare. Personally, I did two slow laps around the parking lot, hit the porta pot twice, slabbed on sunscreen, and stretched while waiting. Finally Ron picked up his bull horn and made some race announcements. He went over the race course with everyone, directed us to line up, introduced the director of our local Parks and Rec office who had also known Ben Moore, and moments later the gun went off. Standing at the start line, surrounded by 185 other runners I felt just like I did standing at the start line of the Cooper River Bridge Run surrounded by thousands of other runners. My only thoughts were about my own running plan. I didn’t want to start out too fast and I wanted to maintain a 9-minute/mile pace. Immediately after we turned right out of the park n’ ride were were ascending a small hill and I was pleased with myself that I had been training with hill runs. No sooner did that hill end than we were descending a steep, curving hill that I realized would be nothing less than totally brutal on the way back. From there it seemed as though nearly every mile included a hill of some grade or distance. I never knew Ben Moore but it didn’t take long for me to determine that the runners he trained weren’t nicknamed “Moore’s Marines” because they practiced easy, flat runs; it was because they ran difficult, hilly, and long routes. Despite there being more hills than I had anticipated, the course was gorgeous. I had never before been down a single street that we ran so I got to see a whole new area of Annapolis. Many of our turns were through beautiful, mostly shaded neighborhoods with water stops at the end of a cul-de-sac down a long road. Though some of our turns were out-and-backs which I normally don’t like, in the race it was fun because I got to see the lead runners and cheered on the people I passed. At mile three I was amazed at how great I felt and when I checked my watch I was thrilled to see that my pace was under 9 minutes. At mile four I had the same pace and again at mile five which is where it also dawned on me that I could have been timing my splits with my watch but decided it was too late for that. I really felt like I was cruising and was worried that my pace was too fast. When I looked at my watch at mile six and saw my time was 52:26 I was ecstatic; that was the best six-mile split I’d ever had! All the way through mile nine I was feeling great and I was also thinking about the Annapolis 10-mile run at the end of August and what my goal pace would be for that run. But then the Ben Moore course had a stretch of road with no shade and I finally started to feel the effects of the heat and my faster pace. I knew that finishing would be a mostly mental feat. In my head I broke down the rest of the race into one mile segments and wanted to take it just one mile at a time. On one hand I really love running a route I’ve never run before, particularly in a race setting because I have no preconceived notions of how I’ll perform and I go out giving it my all. On the other hand, not having run this route before I had no idea of the number of hills remaining in those last few miles. With each hill and turn toward the finish I awaited the next water stop. Finally I hit mile 11 and I was certain the only remaining hill was the steep beast we had so happily cruised down at the beginning of the race. My plan was to continue with the “one mile at a time” approach. 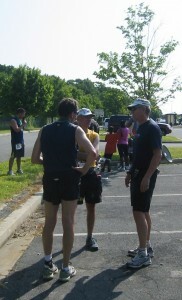 Race director, Ron Bowman (right) talking with runners after the race. The last three quarters of a mile or so to the mile 13 marker were hard. I couldn’t wait to finish and if my watch was correct I was going to meet my goal time. I was thirsty, hot, and my legs were heavy. At the mile 13 mark, like magic, I found my extra gear. I remember this feeling from every other race I’ve ever done where that extra surge of energy appears out of nowhere and allows me to push hard and sprint through the finish. I crossed the line with 1:57:17 on my watch. My official time provided by Blue Point was 1:57:32 and either way I achieved an 8:58/mile pace, finished 33rd overall, and 3rd in my age group. I was one happy runner. 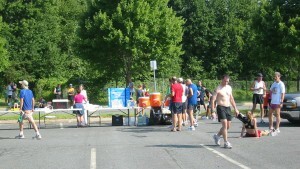 The post-race scene at the park n' ride. I thanked Ron for putting on a great race and said while I found the course to be somewhat of a killer I really enjoyed it. While stretching and downing water I talked with a few other runners. Two of the runners were from Minnesota and visiting the area for a few weeks and just wanted to get a race in. Others, like myself, just wanted to run a local, timed race. The initimate nature of the Ben Moore Memorial Half Marathon and 10K ended up suiting me just fine and I look forward to returning next year. Only next time, I plan to be ready for that last hill. This entry was posted in Running and tagged Annapolis, Ben Moore, Blue Point, half marathon, race on August 3, 2009 by Natalie. 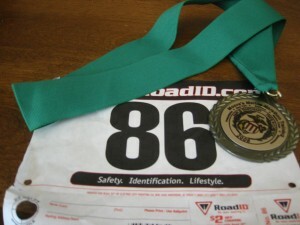 I also ran that race and came in from PA for this race. I thought it was awesome to have a decent priced race being timed. I found the course to be somewhat hilly. That last hill was brutal. Eventhough it was a PR for me. My legs felt heavy and the heat was hot. I am bringing a large group with me next year to do that race. I would like to see some splits on that race it would be nice. 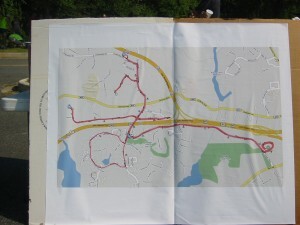 I did notice some runners did get lost who ran the 10K. They needed more volunteers. More Signs would have been nice as well. Overall I give that race a 4/5 stars. I was the one next to you, and the “Okay, let’s go” after our short walk up the hill was helpful. However, unlike you I started my sprint just a little too early and had to throw in another short walk. I enjoyed reading your review and think it is accurate. Good luck in your future runs. @Gary, thanks for making the trek to Annapolis for the race. I agree, I’d like to rally all my runner friends for next year’s race and I’m sure Ron Bowman will take all feedback into account for next year’s race. Happy running! Wish I’d know about this one. Next year!